Virginia Tappe, 91, formerly of Durand, passed away in hospice care on Thursday morning Jan. 17, 2019, at Prairie Pointe in Altoona. Virginia Tappe, daughter of Albert and Lily (Sell) Ida was born July 22, 1927, in Lincoln Township, rural Augusta. As a child she attended Lincoln and Rodell Country Schools. She was united in marriage to James C. Tappe on May 6, 1948. The couple lived all their married life in Durand. For the past 3 years Virginia made her home at Grace Willowbrook Assisted Living in Eau Claire. Virginia had worked as a waitress at the Uniroyal cafeteria and later drove school bus for the Durand school system for over 30 years. 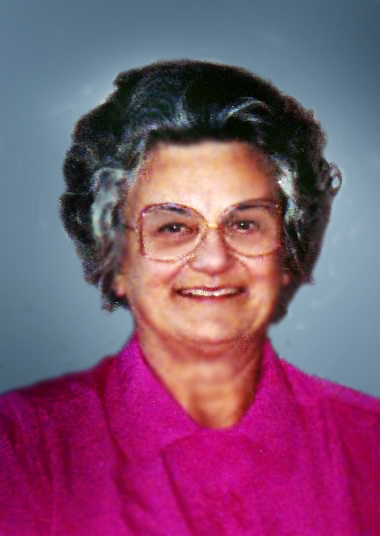 She was a life time member of the Pentecostal Assembly in Eau Claire, where she taught Sunday school for many years. Virginia had enjoyed quilting, knitting and many other needle crafts. She had also worked as a professional wedding cake baker and then for family and friends. She also enjoyed hunting, fishing, playing the piano and a little bit on guitar. Virginia will be dearly missed by her 2 daughters, Diane (Rod) Pettis, Kathy (Gary) Henn; son, Jon (Kris) Tappe; 5 grandchildren, Sherri, Bryan, Gavin, Connor and Kaelyn; 2 great granddaughters, Charlotte and Julia; brother, Ira (Helen) Ida; and many nieces and nephews. Virginia was preceded in death by her parents, Albert and Lily; husband James; brother Richard; and granddaughters, Shelley, Michelle and Chanda. A visitation will be held Saturday, Jan. 26, 2019 from 12:30 p.m. to 2:00 p.m. at the Anderson Funeral Home in Augusta, where funeral services will be held at 2:00 p.m. on Saturday. Burial will be in the Tappe Vue Cemetery in Durand Township, rural Durand. The family would like to thank the residents and staff at Grace Willowbrook for the wonderful care and fellowship she received there and also to the staff of Hartland Hospice for their support and tenderness show Virginia and the family at this time in her life.